Media Mark offers small business marketing plans to meet the rigorous demands of today’s digital, mobile and commercial markets. Our marketing plans include website updates & maintenance, blog marketing, graphic design, print collateral, social media marketing, email marketing, copywriting, photography & video production. Search Engine Optimization (SEO) is inclusive in everything we do! SEO is a primary goal, but unlike many SEO marketers our focus runs much deeper than optimizing websites for page rank. We maintain the human element in everything we do! 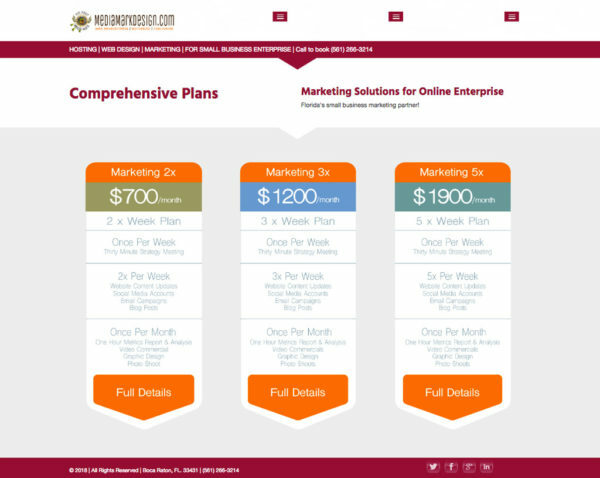 Read through our small business marketing plan specifications. Our comprehensive marketing plans go the distance, including full analytical & ROI reporting and qualification. Our small business marketing plans are calibrated and tuned for a single purpose! To create and maintain professional publishing networks to efficiently, effectively & consistently market your business LOCALLY and on the World Wide Web! Media Mark small business marketing plans qualify, define, write, produce, optimize, implement and publish focused media content for broadcast on a highly diverse set of integrated networks. We define goals, confirm direction and begin production. Collaboration runs as deep as a client desires. We start with a series of business interviews & discovery discussions and follow up with a top-notch publishing platform promoting what your business does best. Weekly & monthly client meetings inspire creativeness and deliver a consistent message, as well provide quantitative analytics to measure and qualify your Return On Investment (ROI). In the simplest of terms – our small business marketing plans focus on consumers finding and purchasing your goods and services, in highly competitive online and brick and mortar markets. We accomplish this through keeping the human connection at the forefront of everything we do, while incorporate superior click-to-sales conversion & customer retention rates. It costs 90% of an advertising budget to bring new customers into your store, and 10% to keep them coming back for more. Our marketing model completes the first 90% and maintains the latter 10% through consumer stimulus, contemporary public relation tools, and quantifiable metrics reports and analysis with proactive campaign adjustments based on consumer interest and habit; key components to meet & exceed marketing, sales and public relations objectives. Small Business Marketing plans are inclusive as defined. Custom plans are available & quoted on consultation. Media Mark comprises a dedicated team of professionals working specifically for small business interests. We specialize in collaboration with business owners to compete successfully locally and on the world wide web. Collaboration runs as deep as a client desires. We provide the expertise and direction in production and publishing so you can focus on running your business. Monthly metric reports and comprehensive analysis provide real time campaign qualification to manage and adjust campaigns based on real time data. Media Mark produces and maintains effective publishing tools to compete locally and on the world wide web! Developing a strategy specific to your company is key to success. Every business is different. A variety of tactics are necessary to hit the right people in the right way. Your strategy should be defined by how your customers behave. Some businesses rely primarily on inbound tactics, utilizing outbound tactics as needed. Some businesses built success solely using outbound tactics. Marketing plans are built to perform at the highest level of Return On Investment for any budget! 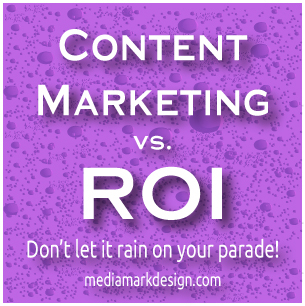 If you have a marketing budget we will increase your ROI! Media Mark assess & analyzes your needs, defines goals, outlines objectives, qualifies target audiences, and consults on the best strategies within a company’s budget. Some businesses come to us with a marketing plan in place looking for implementation, others come to us with no marketing plan at all. We are here to help navigate what’s best for your budget, define and implement target marketing campaigns, produce content, and maintain publishing schedules. We work in collaboration with business owners and managers as consultant, director, content producer, SEO specialist, graphic designer, copywriter, blog moderator, social media manager, video producer and photographer. We help small businesses compete at a higher level. Once per week: Meet with client – Thirty minute strategy meeting. Once per month: Meet with client – One (1) hour metrics report & analysis. 2x per week: 4-Social Media Networks. Email Campaigns. Blog Posts. Monthly: Production: Photo: 1-1-hour photo shoot. Video: 1-15-second video commercial. Graphic Design: 2 graphic design projects. 2 website content updates. SEO is all-inclusive. 3x per week: 4-Social Media Networks. Email campaigns. Blog posts. Monthly: Production: Photo: 2-1-hour photo shoots. Video: 1-30 second, or 2-15 second video commercials. Graphic Design: 4 graphic design projects. 3 website content updates. SEO is all-inclusive. 5x per week: 4-Social Media Networks. Email Campaigns. Blog Posts. Monthly: Production: Photo: 2-2-hour photo shoots. Video: 1-90 second, or 2-30 second, or 4-15 second video commercials. Graphic Design: 4 graphic design projects. 4 website content updates. SEO is all-inclusive. Welcome to Media Mark. We hit your media mark!